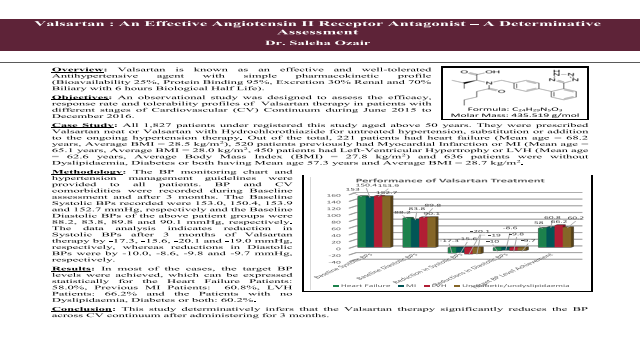 Abstract: Valsartan is known as an effective and well tolerated Antihypertensive agent with simple pharmacokinetic profile. An observational study was designed to assess the efficacy, response rate and tolerability profile of Valsartan therapy in patients with different stages of Cardiovascular Continuum from June 2015 to December 2016. All 1,606 patients registered under this study aged above 50 years. They were prescribed Valsartan neat or Valsartan with Hydrochlorothiazide for untreated hypertension, substitution or addition to the ongoing hypertension therapy. Out of the total, 520 patients who had Myocardial Infarction, were in Mean Age group of 65.1 years and Average Body Mass Index (BMI) of 28.0 kg/m2, 450 patients who had Left Ventricular Hypertrophy, were in Mean Age group of 62.6 years and Average BMI of 27.8 kg/m2, and 636 patients who were without Dyslipidemia, Diabetes or both had Mean Age of 57.3 years and average BMI of 28.7 kg/m2. The BP monitoring chart and hypertension management guidelines were provided to all registered patients. BP and CV comorbidities were recorded during Baseline assessment and after 3 months. The Baseline Systolic BPs recorded were 150.4, 153.9 and 152.7 mmHg respectively and the Baseline Diastolic BPs were 83.8, 89.8 and 90.1 mmHg respectively. The data analysis indicates reduction in Systolic BPs after 3 months of Valsartan therapy by -15.6, -20.1 and -19.0 mmHg respectively, where as reductions in Diastolic BPs were by -8.6, -9.8 and -9.7 mmHg respectively. In most of the cases, the target BP levels were achieved, which can be expressed statistically for the Previous MI Patients: 68.8%, LVH Patients: -71.2% and the Patients with no Dyslipidaemia, Diabetes or both: 67.2%. This study determinatively infers that the Valsartan therapy significantly reduces the BP across CV continuum after administering for 3 months.